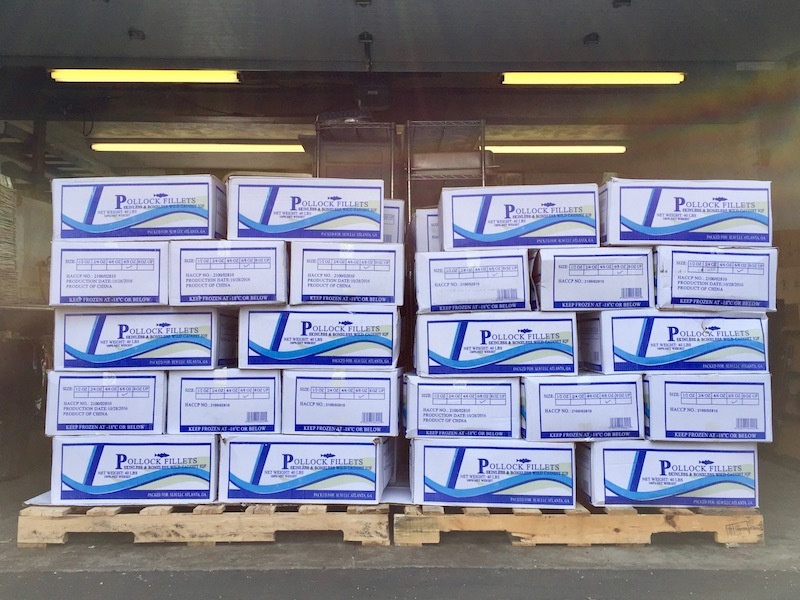 Editor’s note: When Orbit cub reporter Lee Floyd pitched the idea of a one-lunch back-to-back fish vs. fish showdown comparing two of the area’s finest, we thought he was crazy…crazy like a fox! Here’s Lee’s take on the day. Pittsburgh may not be known for seafood, but we can deep fry a frozen filet as well as any city with a coastline. 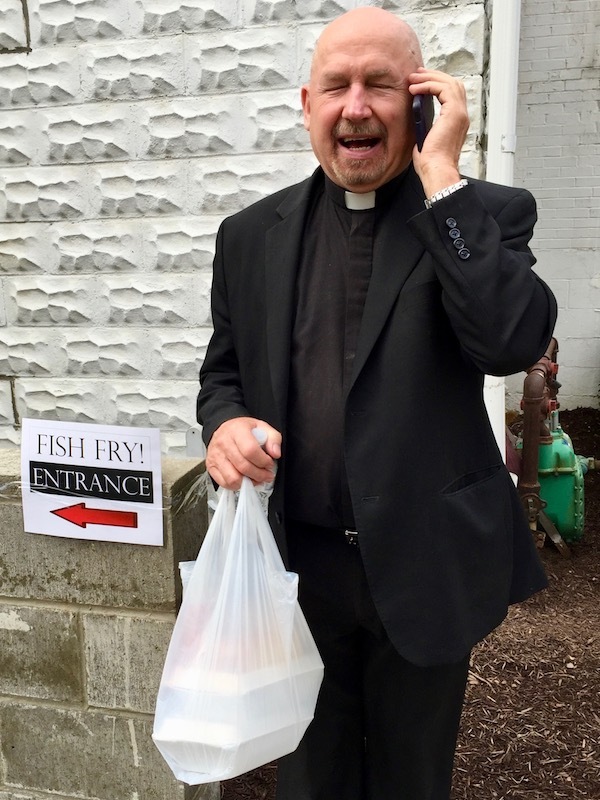 I’ve ordered fish in several states that couldn’t hold a candle to the piping-hot deliciousness served up by volunteers at churches and firehalls around the Steel City. The solemnness of the Lenten season is completely lost on The Orbit as we seek out Friday lunch like wide-eyed, salivating animals. The fourth day of Spring, sunny with a high in the mid-60s, was perfect weather for a bicycle-based culinary tour. I pedaled against the wind to meet today’s dining partner (and Orbit editor) for a double dose of our most-beloved sandwich. 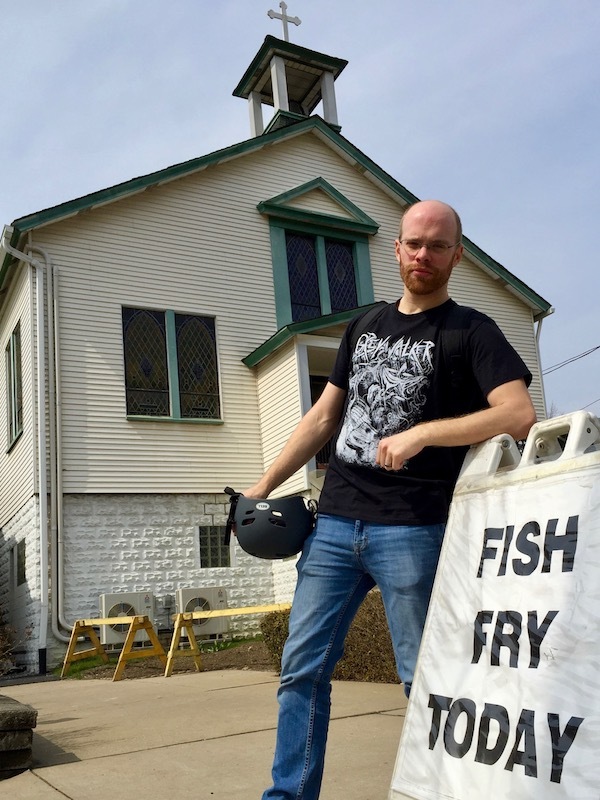 I was determined to impartially judge two of my local favorites because, while every local news outlet and their mother has a fish fry guide or a basketball-style bracket for the best fish, it is really just a popularity contest. I even take my own opinion with a dash of hot sauce unless I can compare two things back-to-back. So that’s exactly what we set out to do. Our first stop was right in the middle of the lunch hour so we found Holy Angels Parish packed to the gills. We were greeted at the door, handed menus, and bid good luck in finding a seat. Once we were situated, we simply flashed a pink card and a server arrived to take our order. There was very little hassle or delay despite the size of the crowd, although you might disagree if you were looking for parking in Holy Angels side lot. Bon appétit! Satisfied Holy Angels customers digging-in. Let me tell you about that fried fish sandwich! 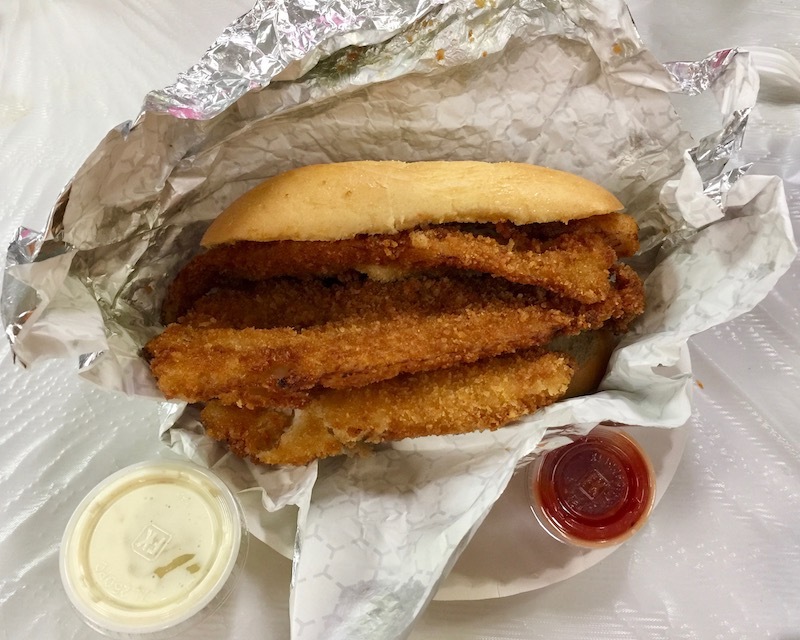 Holy Angels dropped three generous panko-crusted Pollack filets into a standard hoagie bun and nothing was ever the same again. It was obvious these were express shipped to the table straight out of the fryer–I even burnt my finger after the photo-op. 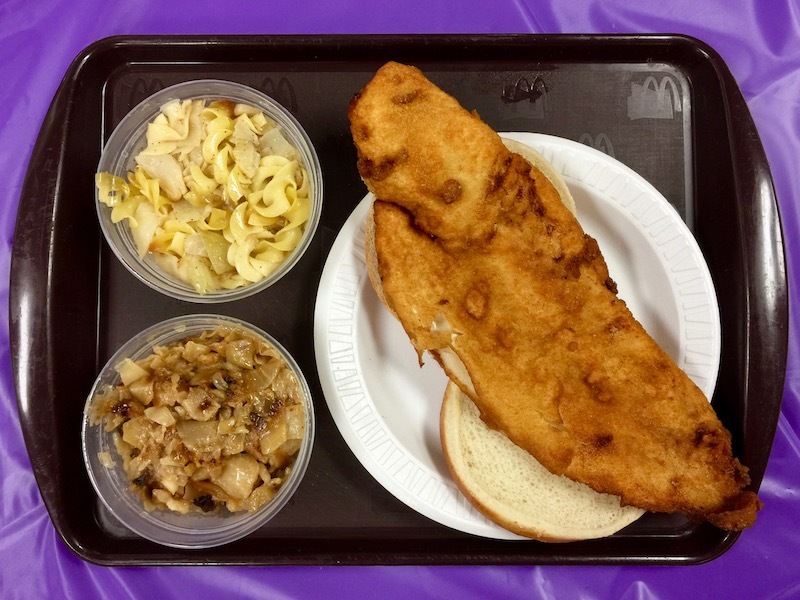 Holy Angels also offers baked fish options, the standard sides (we tried the mac and cheese–gooey and good, but nothing special), two seafood-based soups, cheese pizza, and a tantalizing, largely homemade-by-parishioners dessert table. To protect the integrity of this story I scolded my editor: “Are you really going to put the hot sauce on your half before you taste it!? !” Our fellow fish-fiends/tablemates overheard and immediately began to relate their Lenten exploits (we added West Mifflin’s Holy Trinity to our to-eat list) and gloated that they know the best restaurant that serves fried fish year round–Rene’s (pronounced “REN-ees” or maybe “REE-knees“) in McKeesport. The conversation lasted longer than our meal and so I forgot about the (terrible but empirical) plan to pocket part of a sandwich so I could compare alternate bites at our second stop. After a combined three mile ride via river trail and Homestead side streets, a palate-cleansing flight of craft beer at Blue Dust, and one calf-straining climb up the hill to 13th Ave., we found ourselves locking up our bicycles next to the 24-foot-tall likeness of St. Joseph the Worker just outside St. Maximilian Kolbe Parish in Homestead. At St. Max, you order and pay just inside the door before entering the hall. My editor-of-little-faith’s jaw hit the floor when he found out the good saint serves beer alongside scripture. By the time we finally got done picking it up, our food was ready. As Rick Sebak put it, “The bun is just a handle”, and never was he more on-point than at St. Max. The parish serves one absurdly long, flaky filet on an oversized–but still way too small–bun. It is not only substantial but also cooked and seasoned with a hand that we can only assume is heaven-sent. Loose, thin breading ensures the fish remains the star of the show. At this stop, we chose to sample both types of haluski on the menu–egg noodle and the more traditional potato dumpling–which were part of the largest church menu I’ve ever seen. The extended offerings also include baked and fried fish, crab cakes, shrimp, pierogies, haluski, linguini, pizza, stewed tomatoes, deli salad sandwiches, and more–in addition to the standard sides and dessert table. If you plan to arrive by bicycle along the Great Allegheny Passage trail, then Holy Angels is much more accessible–it’s just a short, easy ride up from the break under the Glenwood Bridge. 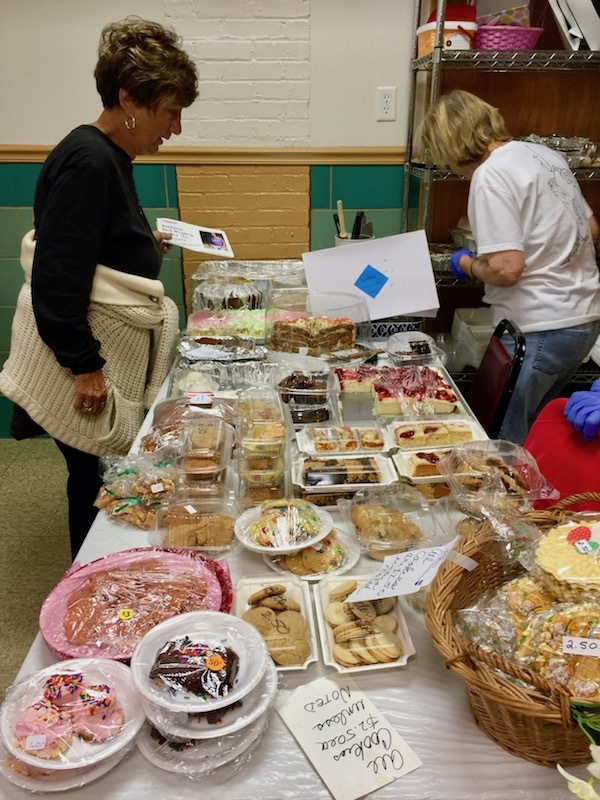 If your sweet tooth is what gets you to leave the house, Holy Angels wins the dessert table by a nose for its homemade bringings-in. 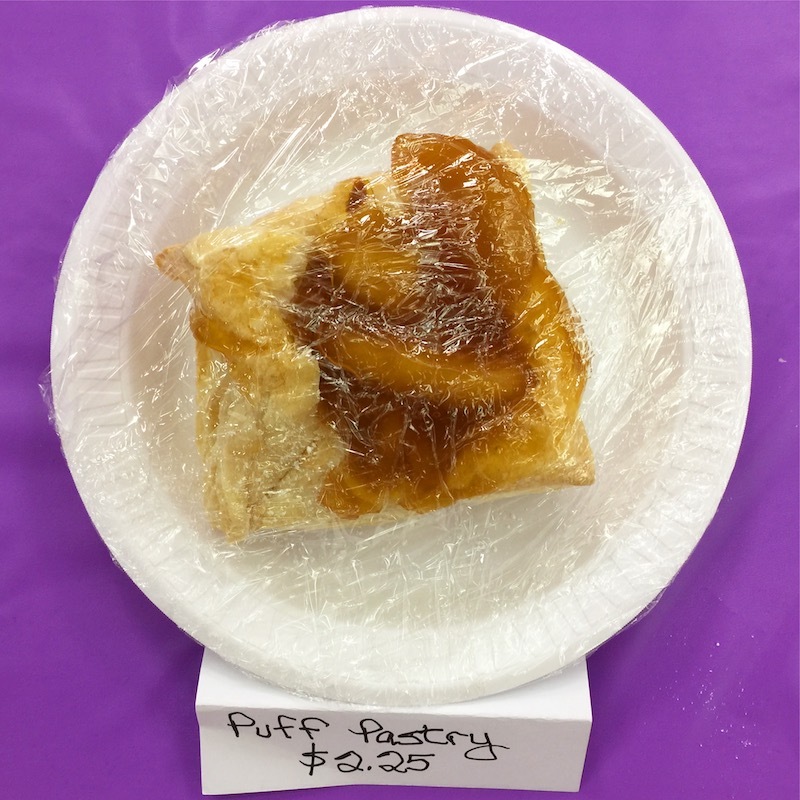 That said, St. Max’s had some of parishioner Shirley’s cream puffs that blew our mind. 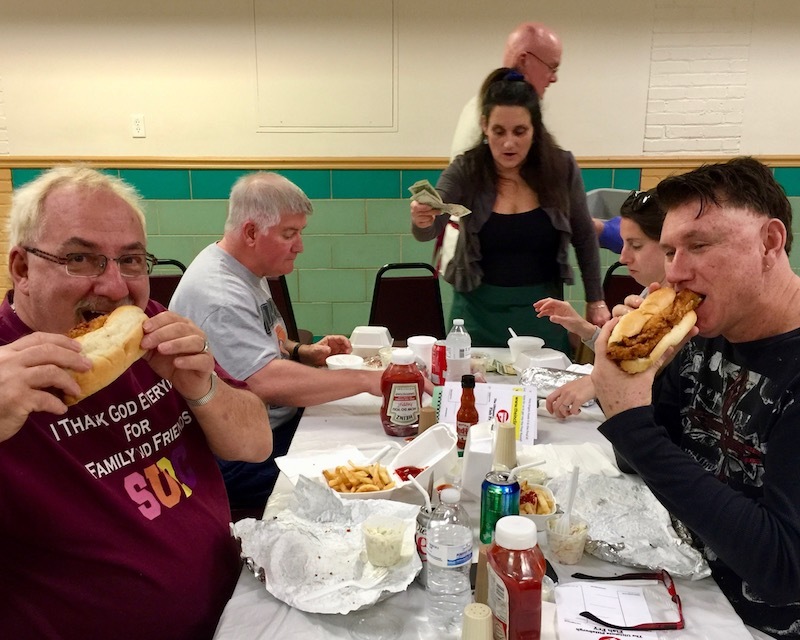 If you enjoy the chance to share a table with strangers, either location will probably do, but Holy Angels is known for being packed to capacity. The crew at our table were a particularly lively bunch that couldn’t wait to share and compare info on other fish fries. The cheese pizza at either location should keep the children quiet, but if you need to order for diverse tastes, then perhaps the larger more-ethnic menu at St. Max will make you the hero of the office. 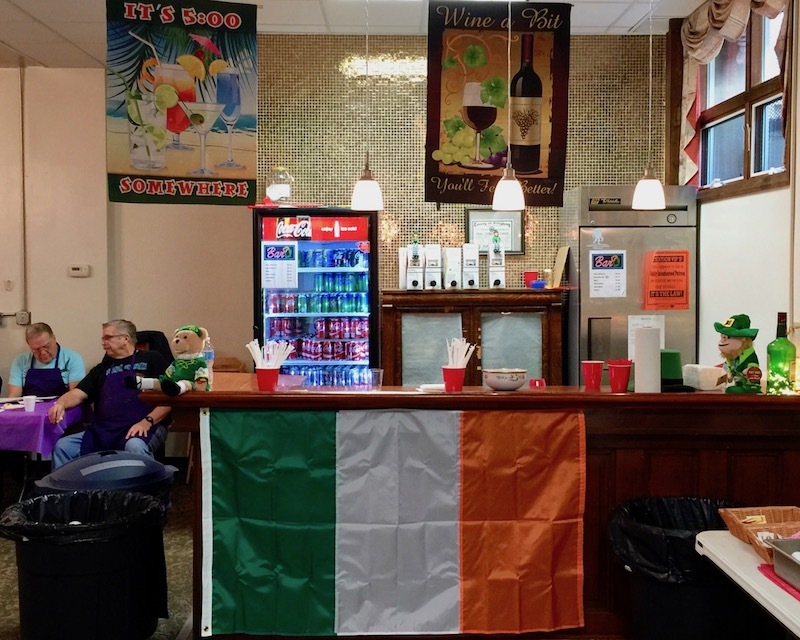 If you like to get canned-up on domestic brews at dive bar prices with the option to confess it all in one convenient location, then St. Max’s “It’s 5 O’clock Somewhere” bar is your spot. If you’re ordering to go and have a fear of soggy breading, then St. Max is my recommendation. Winner winner, fried fish dinner. It’s said that difficult decisions are so because there simply is no right answer. What’s clear from this attempt to pit parish vs. parish, panko vs. batter, Lucy’s cheesecake vs. Shirley’s cream puffs is that when it comes to the fish on The Orbit‘s list, we’re all winners…except maybe the fish. The fish are probably not the winners here, but the rest of us are winners. Eat well. Holy Angels Parish: 408 Baldwin Road, Hays. 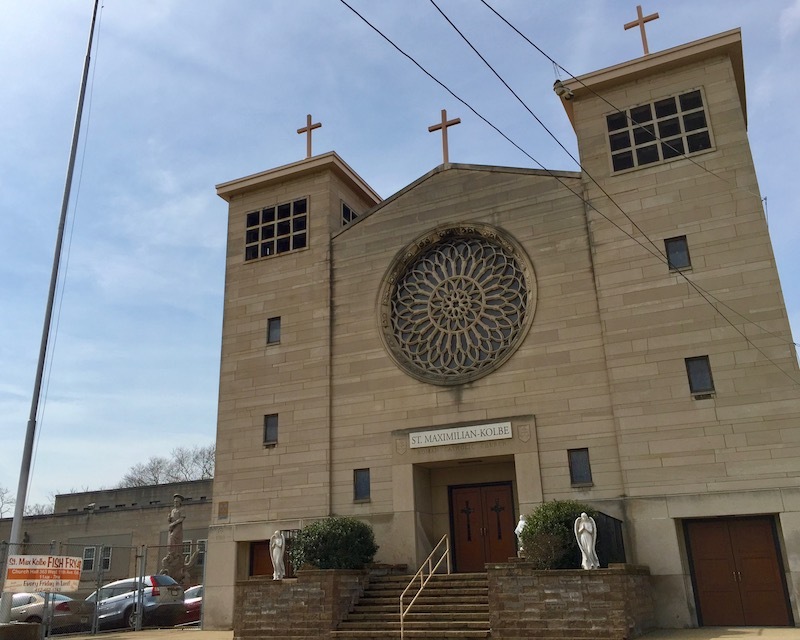 St. Maximilian Kolbe Parish: 363 W 11th Ave, Homestead. Both serve fish Ash Wednesday and all Fridays of Lent, 11 AM – 7 PM…or until the fish runs out.